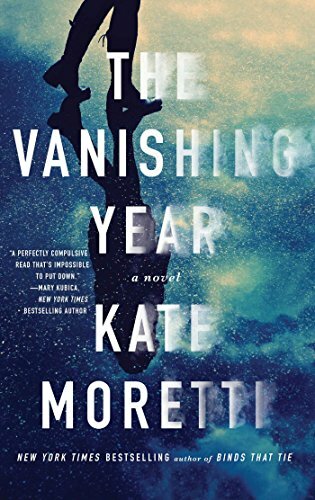 "The Vanishing Year" by Kate Moretti ends with the remark, "Sometimes life gives you a third chance. Who knew?" This is a book about chances: about taking chances, about taking risks, about being open to new opportunity, and about finding yourself and losing yourself in the process. Don't ask me how I found this book because, for the life of me, I can't remember. I think I was just foraging in the stacks and was struck by the interesting looking cover and title. Now that we are talking about it, the cover is exquisite--even Kate Moretti comments about it saying, "I could not be more thrilled with the cover." However, there is no indication anywhere regarding who the artist is who created it! It is very interesting how spotty the acknowledgements are for the artists who create the covers for books. The cover for "The Vanishing Year" has this interesting effect in that the left hand side is clear and focused, but as you move towards the right the print fades and the clarity blurs, or better said, starts to vanish. There are also the legs and feet of a person, plus the shadow that person casts stretching downward which builds on the whole concept of the doppelganger which plays a significant role in the book. But enough--I don't want to get into any spoilers. Suffice it to say that the cover is quite striking and I'm sure that's why I noticed the book as I walked by and reached out and grabbed it. Now let's focus on the plot to the novel. It is as follows: Zoe was working in a flower store in New York City until she was noticed by the fabulously wealthy business tycoon, Henry Whitaker. After a whirlwind romance, they get married and Zoe is swept away into a life a luxury where her every whim is satisfied, and she is able to promote the charitable organizations that she believes in. Everything appears wonderful until there is an attempt on her life and she begins to suspect that all is not how it seems with her handsome new husband. Meanwhile, she is hiding her dark and dangerous past. Is she threatened by the monsters of the present, or by something reaching out to destroy her from the past? And who is the mysterious Tara, Henry's first wife, who died under very suspicious circumstances. Kate Moretti is the New York Times Bestselling author of "Thought I Knew You", which was on the bestseller list for a full week. She is also the author of two earlier books entitled "While You Were Gone", and "Binds That Tie". I wasn't able to find that much about her other than that she lives in Pennsylvania with her husband and two kids. She has also worked in the pharmaceutical industry for ten years as a scientist, now a technical writer, and has been an avid fiction reader her entire life. She is still new to writing success and so we have a long way to go before we learn more information about her. As it stands, there is one youtube interview which she did that I will later post which can give you a better impression of Kate Moretti as a person. From that video, I get the feeling that she is definitely a very down to earth, sincere individual, and I will admit I was touched at how mussy her hair was during the interview. She is not in the least corporate zombie like so many more established popular authors appear to be. Hopefully, she will stay this way! In many ways, Kate Moretti reminds me of Wendy Wax in that she bounced around somewhat before she found a good home for this recent book "The Vanishing Year." Her story is one that many budding novelists will delight to read about and find hope in its details. Originally, Ms. Moretti's books were self published through Red Adept Publishing, and it was only when her more recent book "Thought I Knew You" hit the NYT bestseller list that her now agent Mark Gottlieb of Trident Media Group called her and asked if he could represent her interests. Mr. Gottlieb was then able to place the book "The Vanishing Year" with the more traditional publishing company Atria Paperback. Kate Moretti attributes her success in self publishing to a very well conducted grass roots campaign as well as to the positive and supportive experience that she had at Red Adept Publishing. Atria Paperback, a more traditional, mainstream publishing company seems like just the right next step. Atria Paperback is a general interest book publisher, and is an imprint of Simon & Shuster. The Company is led by Judith Curr, who is both the President and Publisher of the books they produce. According to Wikipedia, the word Atria means a place where things can grow and flourish. Judith Curr chose that name for the Company because she believed that the name "embodied their intentions to build a bridge between reader and writer." In particular, Curr was interested in seeing that "digital and traditional printing practices would go hand in hand. This means that Atria has been particularly open to writers who have made a name for themselves independently through social media such as Youtube or through self publishing. Kate Moretti's books are also notable because it is within the context of her work that I first heard of the genre of writing known as "Domestic Suspense". Apparently, this term has been most fully explored by the writer Sarah Weinman who popularized the name for the genre in her book "Troubled Daughters, Twisted Wives" a collection of short stories she published in 2013. According to Weinman, this kind of writing primarily appeared between World War II and the height of the cold war. It includes such highly regarded, but mostly forgotten women writers such as Marie Belloc Lowndes, Elisabeth Sanxay Holding, Vera Caspary, and Margaret Millar. While it is primarily an area covered by women writers, there are some men who qualify as belonging to the genre such as Harlan Coban, Linwood Barclay, Ira Levin, Francis Iles, and C.S. Forester. The genre revolves around stories of women who are trapped by bad marriages or by crippling cultural norms who find a way to fight back. In our modern day, the most prominent author of the domestic suspense variety is Gillian Flynn, author of "Gone Girl." As Paula L. Woods of the L.A. Times put it, Domestic Suspense "is about the darkest impulses that begin at home." The blog "Mysterious Matters", describes Domestic Suspense as, "a book where the prime source of action is the nuclear or extended family where 1) each member has secrets they keep from each other; 2) one family member is an evil seed and the others don't know or pretend not to know." In other words, domestic suspense locates the drama right in your own home sitting at your dinner table. Overall, this was a very suspenseful book and once I got started reading it, I was unable to put it down. I will admit that when I was close to the final pages of the book, I jumped to the end because I couldn't wait to find out what happened. I particularly enjoyed the way Kate Moretti handled the issue of identity and took it upon herself to explore what are the elements that make you who you are, what kind of context can either enhance certain qualities of character that you have or squash them. In some ways, I felt the book was kind of unidimensional in its portrayal of the characters which I feel is more typical of a romance novel. But then the plot spilled over into the complexities of mystery which added to the richness and depth of the book. I had trouble with the motivation sometimes; for instance, I wasn't sure why the journalist, Cash, became so invested in the case and ultimately in Zoe herself. That wasn't very convincing to me. In many ways, the most fully realized character was the villain, which is, unfortunately, the case in many of these kinds of stories. Still, these are really fairly small, nitpicking points in contrast to the pleasure I got from reading the book. I understand there is a new book by Kate Moretti coming out soon entitled "The Blackbird Season." I will certainly be looking forward to it.